Orphreys are decorative bands that are sewn on to ecclesiastical vestments. The use of such bands over seams can be traced back to the everyday clothing of the first Christians in the late classical period. It is thought that they were originally used to cover and strengthen seams. Often the orphreys survive when the original garment to which they were attached has been lost, indeed they were recycled over time as the base fabric wore out. The shape usually reveals which particular vestment they were made for. Cruciform orphreys were used for the back of chasubles and pillar orphreys for the front. This imagery is representative of orphreys as it depicts Jesus Christ in Majesty on the back, set between angels and a number of saints, each within a niche. Linen, embroidered with silver and silver-gilt thread and coloured silks, in split stitch and couched work. The figures are depicted one above the other in niches. 7813 is a T-shaped orphrey, depicting from top to bottom Jesus Christ giving a blessing, two Saints, possibly Saints Peter and John the Evangelist, though not clearly identified by attribute, and half of a third saint; in the cross branches of the T on either side of Christ are angels. 7813A is a column which depicts five saints within niches: three are bearded and two are not. Most saints hold books, but one holds a sword pointing upwards in one hand and a book in the other, so may be St Paul. The drawing that was made on the linen to guide the embroiderer is visible in worn parts of the design. The incomplete niches at the bottom of the orphrey bands suggest that the orphrey was originally longer. Historical significance: Significant as a relatively rare survival of ecclesiastical embroidery of this period. The use of decorative bands over seams can be traced back to the everyday clothing of the first Christians in the late classical period, the clothing from which Medieval ecclesiastical vestments derive. It is thought that they were originally used to cover and strengthen seams (Johnstone, High Fashion in the Church, p. 1). 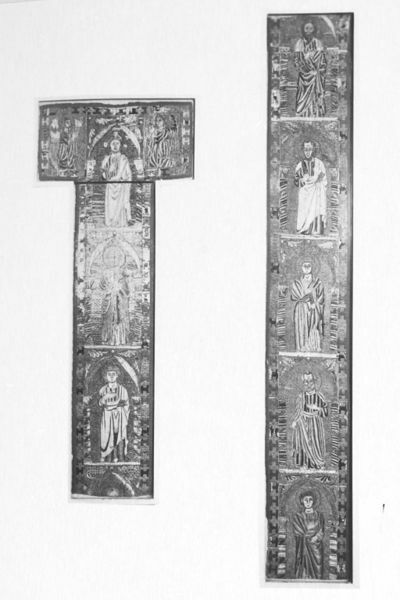 Orphrey bands were usually highly decorative, often created through embroidery, with iconography that related to the life of Christ, and includes images of saints and/or apostles. Sometimes the decoration also incorporates references to the patron who commissioned them. Often the orphreys survive when the original garment to which they were attached has been lost, indeed they were recycled over time as the base fabric wore out. The shape usually reveals which particular vestment they were made for - cope, chasuble or dalmatic. 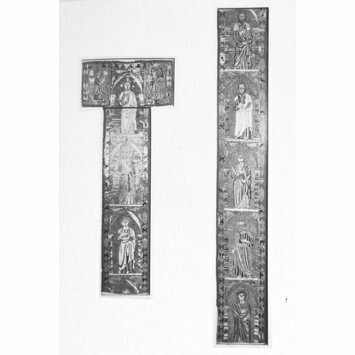 Copes required a single long orphrey, and as one side faced the other when worn, the imagery usually corresponded logically. Cruciform orphreys were used for the back of chasubles, pillar orphreys for the front. Orphrey: linen, embroidered with silver and silver-gilt thread and coloured silks, in split stitch and couched work. Possibly made in Orvieto: this attribution is based on a set of incompletely worked orphreys in the Museo dell'Opera, Orvieto.